There are more than six billion people in this world and I am willing to bet that the majority of us are probably procrastinators. It is just an easy habit to fall into. Think of procrastination as if it were like quick sand. It is easy to stumble and sink into and hard to get out of. Not to worry though, here are some tips that can help pull you out of the procrastination pit. 1.Set an abundant amount of alarms. As a procrastinator, you all know the feeling of waiting until about fifteen minutes passed your alarm to actually get up. Set several alarms to force you out of bed and to give you time to transition from morning yawns and sighs to being ready for a new day. Also, make hitting the snooze alarm harder to hit to make you get out of bed with each alarm. Now I don’t want to outright call myself or SendRecurring users procrastinators, but let’s face it, we all lie somewhere on the procrastination spectrum. This article caught my eye and I was pleasantly surprised by the number one recommendation to be more productive: Set an abundant amount of alarms! SendRecurring has been created from the ground up to be the best way possible to do just that, whether it is through emails or texts. I recently found a fantastic use-case for SendRecurring that allowed me to be more productive. I was faced with the problem of uploading my young family’s five plus years worth of videos to the cloud service we had FINALLY decided on using (Amazon Cloud drive btw). 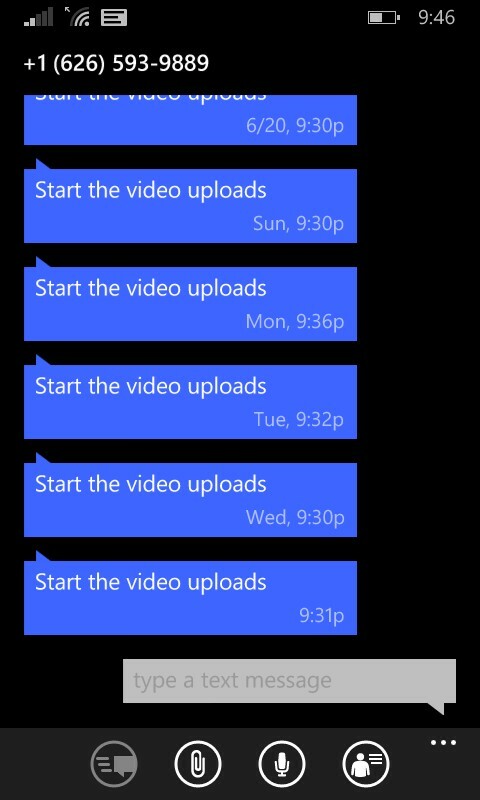 The problem is that we have over 70 GB of footage between the two of us for that time period (a lot). All in all it’s about a 10 minutes of time, so not too bad. However at the end of the evening, after unwinding from work, and watching an episode or two of a good show, it is REALLY tempting to put off anything like this in favor of just… procrastinating. Guess what? It worked. 100% satisfied with how SendRecurring performed, and it led me to some crazy actions…. TEXTING IS BACK FOR ALL ACCOUNTS! CHECK IT OUT NOW! Mr.Cheung on How to Send a Recurring Poll – New Feature!